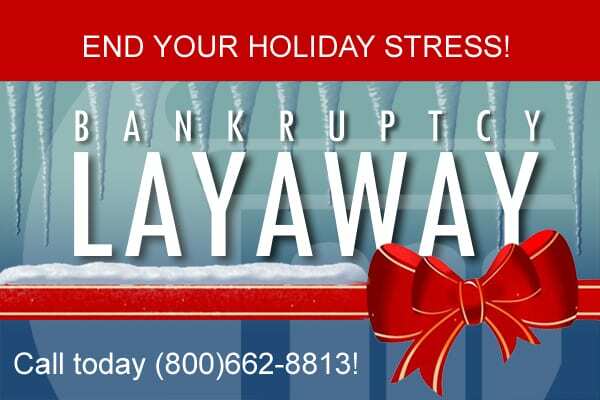 BEAT THE HOLIDAY DEBT STRESS STOP THE COLLECTION CALLS. JOIN OUR BANKRUPTCY LAYAWAY PAYMENT PLAN. How Our $100-A-Month Bankruptcy Payment Plan Started & How It Works. The Merna Law Group is the first consumer bankruptcy law firm in the country to have integrated the age old concept of a layaway plan for those struggling with debt and unable to afford the quick relief of bankruptcy. Even before retailers such as KMart brought back the time-honor layaway program to help consumers financially plan for the holiday season during these touch financial times, The Merna Law Group realized such a program would be an effective way of relieving holiday stress for their clients, reducing the pressure of paying legal fees, and permit their clients to enjoy their holidays. For $100 upfront and as little as $100 per month, you retain an attorney, refer all collection calls to that attorney, and have access to our client services portal and professional advice while we are working on putting your case together. Sound too good to be true? Well, it is not. Step 2: Retain a Merna Law Attorney by November 15th, 2016 to qualify for the program by paying your first $100 and setting up a monthly payment plan of $100. Step 3: Get a bankruptcy filing plan and list of requirements to start working on.. Step 4: Refer all you collection calls and creditor harassment during the holiday season to The Merna Law Group. Step 5: Relax and enjoy the holidays. Step 6: File your case by March 1st, 2017 with your tax refund or earlier and begin start rebuilding your credit immediately with our credit recovery program. Schedule an free bankruptcy consultation today. Additional rules and restrictions apply. Consult your attorney for details. Bankruptcy Layaway is a registered trademark of The Merna Law Group, P.C. All rights reserved. All attorney fees and costs must be paid prior to the filing of your case.